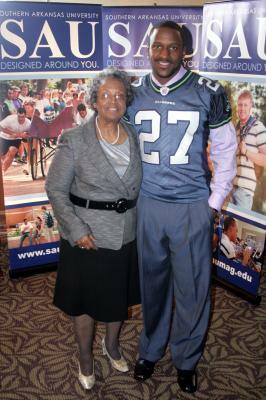 Southern Arkansas University Alumnus Jordan Babineaux returned to his university home on April 24 to visit with old friends and talk about his experience as a defensive back for the Seattle Seahawks. The special event was sponsored by the SAU Foundation, with proceeds benefiting the foundation and the Kathleen Mallory Lectureship Endowment. A private reception with Babineaux was held in the Magnolia Room of the Donald W. Reynolds Campus and Community Center. The reception allowed special ticket holders to meet Babineaux and have their picture made with him before the dinner that followed in the Grand Hall of the Reynolds Center. 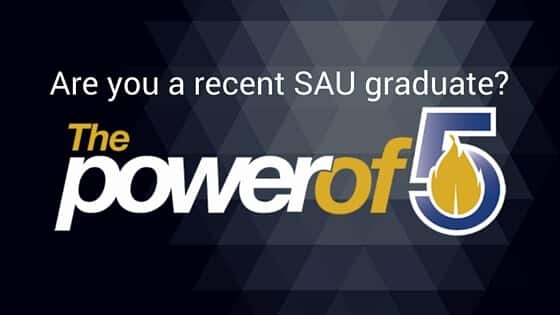 At the dinner, Babineaux told the crowd about the influence SAU had on his life, including the grueling football practices that helped shape him into a player ready for the challenges of the National Football League. But the road certainly wasn’t always easy, according to Babineaux.